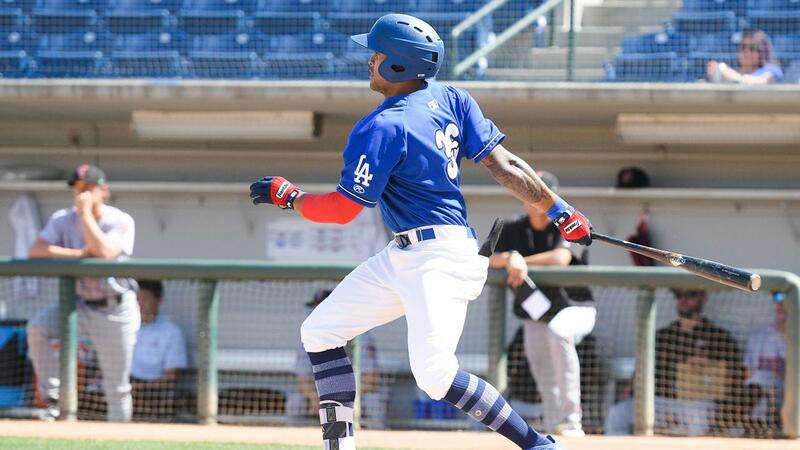 Visalia, CA - Jared Walker will always remember his first hit of the 2018 postseason, as his ninth-inning home run broke a 4-4 tie and sent the Quakes to a 5-4 victory over the Visalia Rawhide at Recreation Park, giving Rancho a 1-0 lead in the best-of-five Championship Series. Walker was hitless in the South Division series against Lancaster and went 0-for-2 on Tuesday in game one, prior to his ninth-inning opposite-field blast. With one out, reliever Matt Brill (0-1) left a pitch over the plate that Walker took down the left-field line for his 18th homer in a Rancho uniform this year and his first of the playoffs. "I wasn't sure I got it," said Walker. "It was 2-0 though and I was taking a hack." Rancho didn't look sharp out of the gate, as starter Leo Crawford allowed three runs in the last of the second. Visalia's Daulton Varsho opened the scoring with a solo-shot, making it 1-0. A Rancho error allowed the second run to score, before Anfernee Grier capped the frame with a run-scoring single, giving the Rawhide a 3-0 lead. Rancho went 12 up and 12 down against Visalia starter Riley Smith, before they got going in the fifth. Connor Wong opened the inning with a single, the first of three hits in the inning. Nick Yarnall, who had two hits on the night, smashed a two-out homer to left field, evening the game at 3-3. Walker drew a bases-loaded walk in the sixth, as Rancho grabbed their first lead of the night. Parker Curry was incredibly sharp on Tuesday, but didn't hold the one-run lead, as he allowed a game-tying homer to Drew Ellis in the bottom of the seventh, tying the game at 4-4. Curry (1-0) rebounded to work a scoreless eighth and earned the win, thanks to Walker's shot. After Walker gave the Quakes a 5-4 lead, Dan Jagiello struck out the side in 1-2-3 fashion, securing the save. Game two of the Championship Series at Recreation Park will take place on Wednesday night, as the Quakes own a 1-0 lead in the best-of-five. Dennis Santana (0-0) will throw on rehab assignment and then be backed up by right-hander Wills Montgomerie. Visalia will counter with right-hander Matt Peacock, with game time slated for 7:00pm. Game three of the Championship Series will be at LoanMart Field on Friday, September 14th, as the Quakes, looking for their third title in franchise history, will host Visalia at 7:05pm. Tickets are available by calling (909) 481-5000 or online at rcquakes.com. Go Quakes!